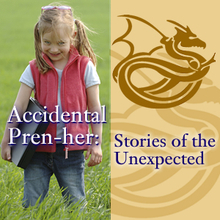 Last month, I interviewed Accidental Pren-her Jeanne Adams for this month's broadcast of Stories of the Unexpected. This 11 minute interview talks about Jeanne's transition from the corporate world to the life of a writer and published author of suspense novels. She has a blog site called Romance Bandits that she shares with a group of writers who all enthusiastically contribute postings -- what a great concept! You can listen to it from your computer by clicking on the play button, download the MP3 file and listening on your iPod or other MP3 listening device, or read it in full below. Welcome to another episode of the Accidental Pren-her Stories of the Unexpected. My name is Susan Reid, and we have as our guest today Jeanne Adams, soon-to-be-published author and CEO of Golden Gryphon Designs. Welcome, Jeanne, it’s great to have you with us today. J: Thank you, Susan. I’m so glad to be here. S: Well, we’re glad you’re here, too. So let’s just talk a little bit about your amazing journey into the entrepreneurial lifestyle. At one time I know that you were traditionally employed as a – holy smokes, get this! – a whole line of things: a corporate, not-for-profit, and government marketing executive. You did the whole traditional route, there. S: And now you’re a writer and marketing consultant with your own company. So, we’re all curious, and I can’t wait to hear about the amazing journey that you’ve taken from traditionally employed to self-employed. So let’s start. When did this all begin? J: Well, it began for me about 7 years ago. I got very restless in what I was doing, I wanted to start a family, there were a lot of things pressing on me, including the changes in corporate structures and those sorts of things. So, about 7 years ago, I decided to just do it. S: It sounds like you just jumped in – and good for you on that one! Now, had you ever been a small business owner before? J: I had not. One of my brothers is an entrepreneur, so it wasn’t unfamiliar. And I had done a few things on the side – side jobs for people doing marketing consulting and things like that – but I had never really committed to doing the whole thing all by myself. S: Well, I love the way you just jumped right in. Now, you mentioned a little bit about the corporate structure and some family things. What made you really decide to go into business for yourself? J: Well, there were some changes in the governmental entity that I was working for…some things that were making it not quite so pleasant to be there. My husband and I were talking about trying to start a family. We made a lot of kind of hard decisions, and I decided, you know, if there’s ever a time to do it, now is the time to do it. Just commit and go for it. S: And you just knew that. You knew it was time. S: And you were brave enough to make that choice. S: And look at the payoff. J: The payoff has been huge, I will say that. It was totally worth it. S: It really has, because now – and let’s just hear this, dear readers and writers and listeners – Jeanne Adams is a newly published author with Kensington Publishing in New York. They just purchased two of your suspense novels. And the first one, Dark and Dangerous – which sounds absolutely delicious, by the way – will be out in June 2008. Congratulations! J: Thank you so much! I could not be more thrilled. And I was even more thrilled that New York Times best-selling author Lisa Gardner was kind enough to read the manuscript and give me a cover quote, and be excited about it as well. So if you’re a Lisa Gardner fan, you might like my work as well. S: How exciting! Yes! Lisa Gardner! Oh, my gosh! Congratulations! S: Jeanne, tell us a little bit about what the writing process is like for you. Where do you get your ideas? Is it a challenge? Does it come easily? How does this work for you? J: Well, the writing process is fairly straightforward in some respects. Ideas are everywhere for a writer. I mean, mostly it’s the question that many entrepreneurs ask: “What if?” What if those two people had this happen? How would they react? What would they do? What if a mobster decided to come after you? What if someone broke into your house? You know, many of the times, those are questions we all ask ourselves, but a writer takes it several steps further and creates a story about it. An entrepreneur usually asks, “What if I made a product that did this?” So, a lot of times, it’s very much like being an entrepreneur. And every story is new, and every story is different. S: I see. Writing really is an entrepreneurial concept, isn’t it? J: It is, in the sense that you are always your own CEO. I mean, you may be contracted with a particular publishing house, but that’s certainly no corporate safety net…because if they decide to change their direction, or they decide they don’t want to publish suspense novels anymore and they just want to publish fuzzy bunny stories, well, you know, then you’ve got to find another contract. So, it’s always that constant self-marketing and self-improvement that comes with being an entrepreneur. So, yes, it’s very entrepreneurial. J: And then, from there, how do you answer that question? S: Ugh. So that really calls into the question, as a writing entrepreneur that you are, of how do you stay balanced? I mean, you have a family, you have two wonderful children, you have a business, you are a published author, you are writing all the time…How do you stay balanced? Because I know from my own process as a writer that, really, writing is an all-or-nothing thing. How do you do this? J: I live by my calendar, and I schedule in downtime and I schedule in time to be with my family. I only write Monday through Friday. I always reserve the weekends to spend with my family. You know, it actually takes planning. And I think any entrepreneur needs to do this. You’ve got to plan downtime. You’ve got to plan time to recharge your batteries. And I know the start-up part of being an entrepreneur is so tough for that, but you still have to do it so that you have more to give and you’re sharp. S: I really honor that you schedule all that time in. It really helps keep you clear, doesn’t it? J: It does. And if you don’t put it on the schedule, it doesn’t happen. S: So, you only write Monday through Friday. S: And you save your weekends for family and kiddos and downtime. S: Do you write at a certain time each day? J: I do. I’ve discovered that the best time for me to work steadily is between 10:00 in the morning and 2:00 in the afternoon. So I make sure that drop-off of children and all that sort of thing and errands and so forth are done before 10 o’clock and I’m ready to sit down. Sometimes I stop at 2:00. My older son doesn’t come home until after 3:00 and some days later than that, so sometimes I go later than that, but I really try religiously to be in the chair at 10 o’clock, ready to write. S: Ah. hat way the muse can find you. J: Yes! She always knows where I am at 10 o’clock. S: Exactly! Now, do you think in terms of “I am writing four hours today”, or is it a word count, or is it a part of a chapter? How do you organize that? J: I get very restless and sort of stymied if I have to make a certain count or if I have to… I just promise myself that every day I’ll be in the chair at 10 o’clock, ready to write. And I will write. It may consist of writing on a story that I don’t know if it’s ever going to go anywhere. I may write journal entries. I may write, “The big red dog runs four blocks” 16 times until something happens! A lot of times, I have a bunch of different “story starts”, so if something is not working for me and I don’t feel like I want to write on that, I’ll switch to something else until I feel like I’m moving. And then I may switch back to my work in progress, or… Now that I’m going to be on deadline for someone who is paying me, it’ll be even more important to be in that rhythm. S: Wow. And I really honor that process of writing. It doesn’t matter what. It’s not for a particular purpose. You’ll be flexible and move in and out. It’s just getting that creative aspect of writing flowing for you, isn’t it? J: It is, indeed. And I know a lot of authors do it differently. They do page counts or word counts or “I’ll write ‘x” number of chapters” or… For me, that gets a little too boxed in, so, for me, it’s just showing up to write. S: Showing up to write. There you go. And I know, because you shared with me earlier, that you have written over the years, is it six books? J: Well, I’ve written nine total manuscripts. Two of them should probably never see the light of day. So, yeah, nine. S: Well, this little writing style scheduled in amidst all the other things that you’re doing here seems to work, then. Look at that! Nine! S: Amazing. Well, we’re near the very end of our time together, and there are five questions that I ask everyone. So, here we go, and just answer as they come. S: What one word describes your life today? J: Oh, gosh. I’d have to say “adaptable”. S: I bet you are! And what quality or characteristic is most important to you? J: I would have to say “laughter” or “humor”, because it gets you through. S: Yes, it does! What repulses you? J: Hmm. Despair. When people just really give up. S: Yes. That is hard. And what inspires you? J: Gosh. Breathing? As a person, I’d have to say my family inspires me. As a writer, I find inspiration everywhere. S: Yeah, that’s what you said earlier. It’s everywhere. And the last question is what’s the most precious thing you’ve learned along this journey from Accidental Pren-her to Entrepreneurial Woman? J: Wow. I’ve learned so many things, but I think probably the most important thing I’ve learned is that you have to believe in yourself and trust your process. You have to be willing to learn from other people – you know, what they’re doing, and if it’s working for them you can try it out – but you always have to focus on what feels right to you and don’t try to force yourself to do something in someone else’s way. You have to trust what your process is. You may take bits and pieces here and there and turn it into your process, but trust that it’s your process. S: That’s really sage counsel for all of us. And for those of us who are on the Inner Samurai journey, it is about that inner knowing of who you are and trusting that process, whatever that is. S: Well, Jeanne, thank you so much for spending your time with us today, and thank you for being on the Accidental Pren-her show. Before we go, I know that our listeners and readers will want to get in touch with you, so tell us how we can do that. J: You can get in touch with me through my website, and there will also be excerpts of the books that are coming up in June and forthcoming books, and that is www.jeanneadams.com. S: Perfect, Jeanne. Thank you so much for being on the Accidental Pren-her show, and we’ll be talking later. I enjoyed your interview very much; especially the part about knowing when you are most productive. 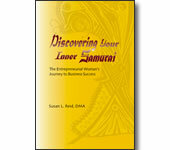 I think that is a very important aspect to realize when you are an Accidental- preneur and mom. Good luck with the publication of your book; hope to see you on the New York Best Seller list! I just have to echo Moschel's well wishes for your book to be seen on the NYTimes best seller list! And thank you both for your good wishes and the NYTimes Bestseller thoughts...put it out to the Universe, who knows what will happen? Grins. Thank you so much for this interview. I particularly appreciated your comments about "writing on" several different story starts. I do that, too, but sometimes it can distract me from the piece I'm trying to finish. Now I can see this as part of the process and a practice that will actually help me be more -- not less -- productive. Agreed, Mary Ellen. It was helpful for me, too, when I heard Jeanne talk about working on more than one piece of writing at the same time. Takes the pressure off, doesn't it? Hi Mary Ellen! And Susan! Glad to know it helped you both. It does help me a lot because getting stuck seems to be part of the process too. Grins. Just giving myself permission to work on something else frequently means I break the block quite easily. I enjoyed your interview and getting an inside look into the life of an author. I love when you said that you "show up to write". It implies an allowing and being in the process - not forcing it. When I do that my business takes on a life of it's own and is really a lot more fun. Thanks for that reminder!